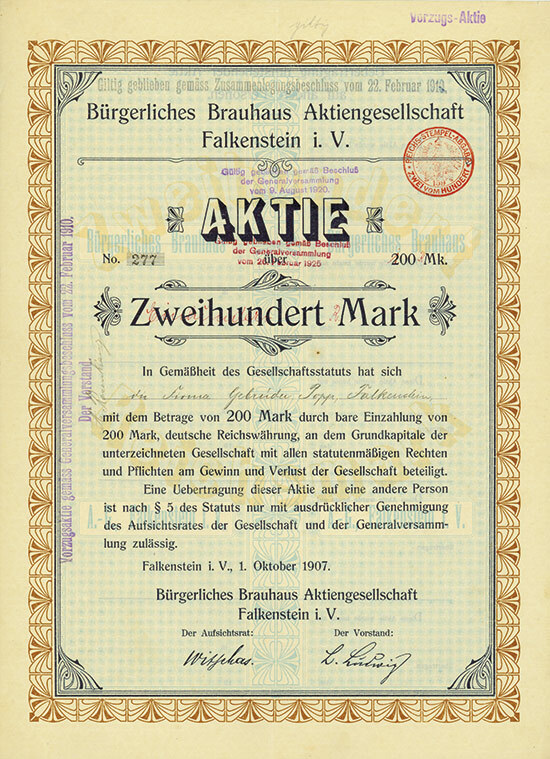 HWPH AG - Historische Wertpapiere - Bürgerliches Brauhaus Aktiengesellschaft Falkenstein i. V.
Falkenstein im Vogtland, 01.10.1907, Namens-Aktie über 200 Mark, später auf eine Vorzugsaktie und 100 RM umgestellt, #277, 35,1 x 25,3 cm, türkis, schwarz, braun, minimale Knickfalte, Erhaltung EF, Auflage nur 500 Stück, ausgestellt auf die Firma Gebrüder Popp in Falkenstein, herrliche Gestaltung, uns bisher unbekanntes Stück aus einer Sammlungsauflösung! Falkenstein in Vogtland, 1 October 1907, Registered Share of 200 Mark, later changed by stamp into a Preferred share and 100 RM, #277, #35.1 x 25.3 cm, turquoise, black, brown, small fold, condition EF, only 500 shares issued, issued to the company Gebrüder Popp in Falkenstein, superb design, first time seen by us, from the dissolution of a collection! The company was incorporated on 29 October 1906 and registered on 10 August 1907. The new company took over from the company Gebrüder Popp in Falkenstein all real estate, including buildings and all inventories which were necessary for operating the brewery and maltery. The purchasing price was 290,000 Marks. This was paid by taking over mortgages of 130,000 Marks, by issuing shares for a nominal amount of 50,000 Marks and by 110,000 Marks in cash. The company produced beer, malt, malt coffee, spirits, liqueurs and semifinished products (mainly essences). The company operated restaurants, one wine cellar and the wholesale with wines, too.